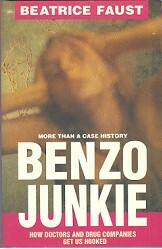 Over half a million people are addicted to benzodiazepine tranquillisers and sleeping pills in Australia alone. How is it that dangerously addictive mind-altering drugs are sold so readily to a trusting public? Beatrice Faust exposes the great international scandal of drugs that are sold without sufficient testing, drugs known to be addictive or harmful from the time they are released. Many, like thalidominde, are notorious; others, less well known, are equally destructive. 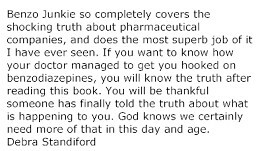 Combining well-documented research and reports from other benzo junkies, Beatrice Faust's timely and important book is a biting analysis of malpractice in the medical-industrial complex. Doctors, drug companies and governments all profit from pushing benzos. Faust goes behond critique and personal experience, pointing constructively towards a more preventative, holistic, patient-centred medical ethos. All you have to do is click the order link below, and you’ll be taken to our secure order page. After you send in your order, you will be taken instantly to the download page. You can be reading your book within minutes!